"Quality that makes an Entrance"
Open up to a new way of thinking. The garage, it's more than a way in, or a way out. Inside it's a parking lot, a gym, a workshop. Outside, it's an extension of your home, a reflection of your personality, of your individuality. Whether you prefer steel, composite or wood, rethink what a garage door is, or can be. Amarr Openings. Open up to the possibilities. 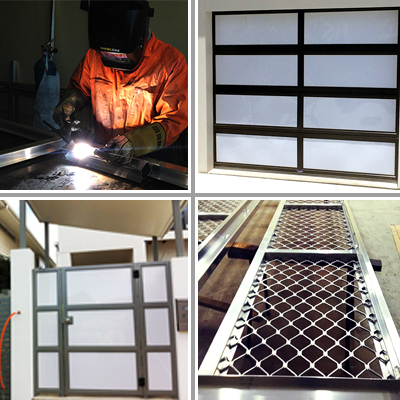 Our Manufacturing Can Design Any Custom Garage Doors and Gates. We supply, service, repair and install a complete line of garage doors, parts, accessories, replacement parts, garage door openers, springs and automatic operator parts for all brands with affordable prices. This includes all hardware and accessories: springs, extension springs, torsion springs, spring cones, rollers, cable, fasteners, drums, locking hardware, door locks, pulleys, sheaves, forks, hinges, bearings, bearing plates, top fixtures (brackets), bottom fixtures (brackets), perforated angle, weather stripping, weather seals, remote transmitters, openers, receivers, opener parts, and more. We supply parts for B&D, Steel-line, Gliderol, Centurron and Amarr. Please note only Amarr offer a complete lifetime warranty. Beyond being functional and reliable, your door should provide the look, quality, and features that add to your home's value and your peace of mind. Maintaining, adding, or replacing garage doors not only increases its curb appeal, but with a properly maintained insulated door, you will increase your comfort and reduce your energy consumption. If you have a commonly used room above the garage or your garage hosts your heating and cooling system you will save on utility bills, both in hot and cold weather and help protect your home. Ammo Doors covers a wide area from Tweed Heads to Bribie Island with technicians not too far away from each suburb in between. No job is too small or too big for Ammo Doors, we aim to cater for all customers from tenants and home owners all the way through to large commercial premises and in between. Please visit our office to choose from a huge range of colorbond colours, or we can powdercoat or paint to suit your garage.